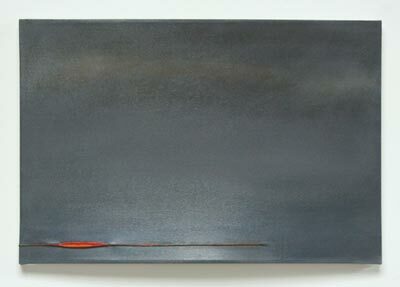 Time spent in contemplation reveals the subtle beauty of the Suffolk landscape which is reflected in my paintings. Muted colour expresses the tranquillity, harmony and immensity of the horizon that is around my Suffolk home. The Suffolk landscape is full of moments of excitement, colour and light, and I am interested in trying to understand what I am experiencing when I see them. I have developed a technique of stretching a manipulated canvas over a curving stretcher, which echoes the soft rolling undulations of the landscape but also creates an interaction with the viewer. Moving around the painting, diverse aspects become dominant, the light catches it differently down a slope, the eye is attracted by a row of stitching, interesting shadows are thrown onto the wall. The stitched lines in the structure of the canvas allude to agricultural and habitation practices that have shaped the landscape we see. The perception of colour in your paintings is very subtle, understated, minimal, layered – do you have a favourite colour (in life or your art)? Blue, it is the colour I understand most and I find the easiest to paint in, which could be considered a handicap for a landscape painter. My recent paintings in green have given me more confidence with the colour. 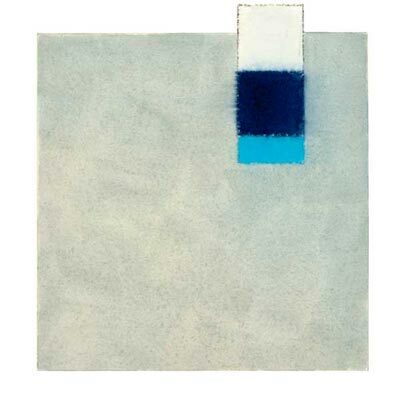 The titles for your paintings are very intriguing too, also quite minimal. How do come about or decide on what you will call them? A trick one this. For a few years I have been calling them times of day and the season. For example ‘8.11 Winter‘ but my current work will have some reference to light, the preliminary work will refer to the final piece. How would you summarise your art in just a few words for someone completely new to your work? It would be calm, followed by full of colour, enigmatic, abstract, and layered. My current work has been building towards a single painting from an initial photograph I took a few years ago. I developed ideas in a sketch book, then sketches in oil on watercolour paper, then oil on oil-ready paper, two studies on canvas and now I am beginning the final piece. This will of course not actually be final as I expect this subject will bug me for many years to come. Could you give us a picture of your studio space/set-up? I work in a converted 1950’s grain store beside my home. My industrial sewing machine is in one corner ready for me to stitch on the canvas for some of my paintings. There are my unsold paintings and drawings of nudes on the wall. More paintings lean against the shelving, they stack really badly because of the curved canvasses. Do you have any music playing while you are painting in your studio? I listen to a variety of classic and solo artists on my ipod. What’s a typical working day for you as an artist: Up early, a few household chores, painting or stretching canvas etc. As I paint in layers of oil paint and I only work on a couple of paintings at a time I have usually done what I can by lunch. Occasionally I will return in the afternoon if I am stretching and priming a new canvas. Dig the vegetable garden etc, walk the dog etc do “stuff” cook, eat sleep start again. And what time in the day are you at your most creative? In the morning. I paint after breakfast then garden or do whatever after that. 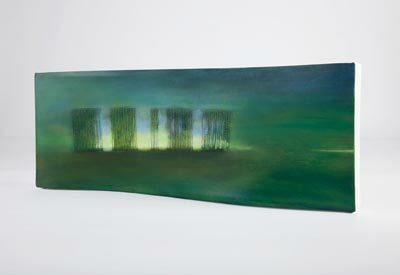 Is there a contemporary artist whose work you particularly admire? The Irish painter Felim Egan. 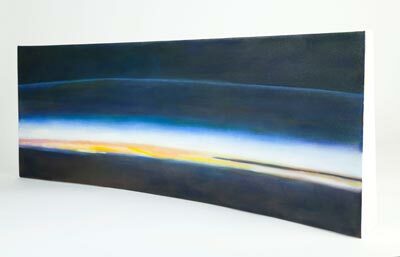 His abstract landscapes have a clarity and spatial understanding that I find very uplifting. 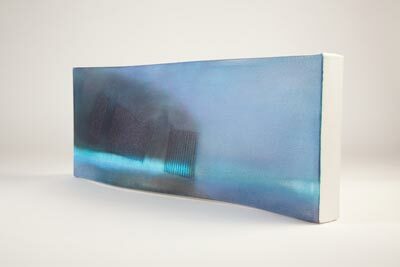 What have you discovered from looking at the work of other artists, such as Egan? That thin unseen layers of paint lift a painting from the ordinary to the extra ordinary. 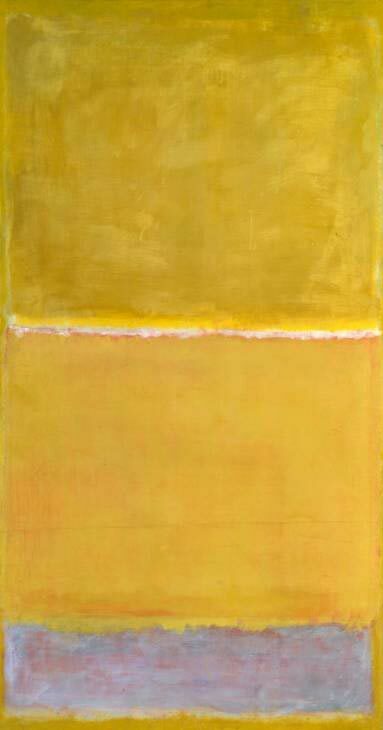 Can you remember the first work of art you ever saw for real? 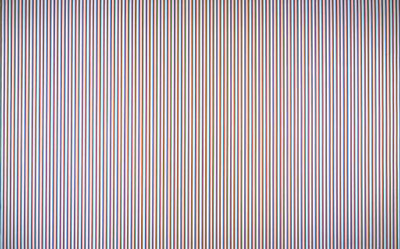 I remember a Bridget Riley Op Art painting during the 1960’s. Her paintings were very exciting. What’s your first memory of creating art and what was it? I remember painting a wave on a sheet of 4ft x 8 ft hardboard with a friend when I was about 15. I went to a very “arty” school form the age of 10/11 so I have many memories of creating everything from copper pots through books to dresses and paintings. That’s very interesting, that you should recall painting a wave, with reference to your own curved canvases and the paintings of Bridget Riley. If you could select one famous artist to invite to dinner (dead or living, it’s not a problem) who would it be and what question/s would like to ask them? Turner. I would ask about how he saw the world and why he painted in such a colourful abstract way. Is there a famous artwork or painting you would really like to own, assuming money & space is not a problem? 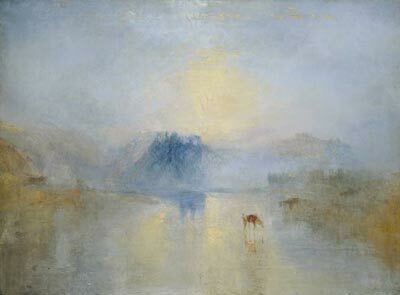 I would happily house anyone of the more enigmatic Turner’s, a Rothko or a Felim Egan. We all have opinions about art. 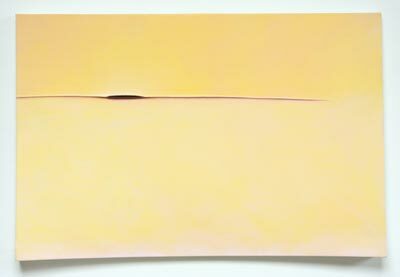 Is there one work of art (contemporary or historical) that you don’t like – and if so, why? 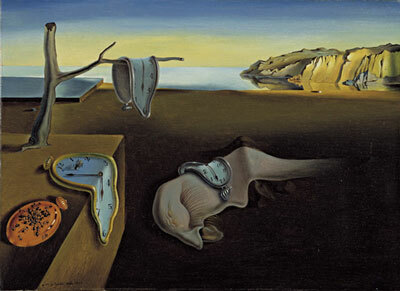 Salvador Dali’s ‘The Persistence of Memory‘. I find it really interesting but the paint is too smooth and it feels slick to me. Drawing is talked about a lot as a fundamental aspect of creating art, what is the purpose of drawing for you as an artist? Drawing reminds me to look, to see really carefully. Photographs are helpful but to really understand, a few minutes with pencil or crayon in hand makes all the difference. What single piece of advice would you give to a budding, aspiring artist? So, what’s in your current sketchbook? It is full of studies on one photo of light seen through trees. Is there an art medium/technique you’d like to try but haven’t yet? I would like to do some more work with print. I did some printmaking during my degree but would like to develop it more. The East Anglian landscape is clearly very inspiring to you as a painter, but the ‘Atmosphere’ series of paintings suggest a different direction. Is there a place in the world that you’d really like to visit, as a new source of inspiration? I would like to visit the Antarctic. If you were stranded on a desert island (or Antarctica!) without any art materials or equipment what would you most miss using? Lastly, lots of people like to ask this simple question of artists – why do you make art? And what do you think is the role of an artist in contemporary society? It’s impossible to say as I think they fill many roles. My role as an artist may be to make people look about them and see the beauty in everyday surroundings. Eleonora Knowland had a successful career in interior design and fashion before studying Fine Art at Colchester School of Art and Design, where she graduated in 2006 with a First Class Honours degree. Married to a Suffolk farmer, she has lived in East Anglia for over 30 years and much of her creative inspiration is derived from the subtle beauty of the open Suffolk landscape. She has exhibited in both East Anglia and London. This entry was posted in artworks news and tagged artist interviews, artists, artworks, east anglia, eleonora knowland, exhibition, paintings, suffolk on May 11, 2011 by admin.